I’m an old-fashioned coffee girl. While it seems like everyone these days has one of those fancy automatic coffee makers that use pods, I refused to hop on that bandwagon, instead opting for my $12 stovetop espresso maker and a manual pump milk frother. And then the Delonghi Nespresso Lattissima Touch showed up on my doorstep. You guys. So. Shiny. At first I was really excited. Finally! A real, big-girl espresso machine! This was the last kitchen appliance on my bucket list. But then I freaked out a little. What had I done??! I had a solid coffee ritual that had kept me happy for years, what right did I have changing it? This was so different from my normal morning routine, there were so many buttons, it was so… automatic. Would my morning coffee have lost its soul? None of that started to matter any more after I discovered how good the coffee was. My little yellow stovetop espresso maker, bless its soul, could not compete with the tastiness of this brew. And my milk frother? Not terribly hygienic, as it turns out. I chose this machine for a couple of specific reasons. First off, It’s small. I live in a downtown apartment, and while I have quite a bit of counterspace, I also have a lot of appliances. I have a toaster, a microwave, a juicer, and a blender, as well as my new KitchenAid Stand Mixer, that sit on my coutnertop all the time. I needed something small that could tuck into a corner. Secondly, I wanted something that had the firepower to make nice, frothy milk. There are lots of espresso machines out there (I owned one once) that just simply don’t have the power to work up a good head of steam. This machine has an automatic frothing container, unlike a traditional cappucino machine, where a nozzle comes out of the machine that shoots steam, and you froth the milk that way. This one has a little bank that you fill with milk, and then it heats and froths the milk as it goes into your cup. It’s kinda cool. You just keep it in the fridge in between coffees. There are 6 buttons on the top of the machine, which makes for a quite a few combos, and, as someone who generally doesn’t read manuals, was a bit confusing. There are three espresso options: Ristretto (25 ml), Espresso (40 ml) or Lungo (110 ml). I generally drink a long shot, or an Americano as they call them here, so I usually choose Lungo. Then, if you like milk, as I do, you also have three options: Cappuccino, Macchiato or a manual version that allows you to decide how much milk you want. The milk frother also has a dial so you can choose how foamy you want your milk to be frothed. I like the macchiato setting, as, if I ordered a bar drink at a coffee shop, it’s usually an Americano Misto. It’s kind of amazing how good the coffee is. This is real espresso–rich and with a perfect crema. There are two really North American-centric things that have become abundantly clear to me since getting this machine. The first is portion size. We’re so used to drinking huge coffees. The smallest coffee at Starbucks is still bigger than the biggest coffee my machine will make. But if you went to Europe (or Joe’s on Commercial Drive) and ordered an espresso, you’d get one exactly the same size as this machine will make. The second factor is bitterness. I usually drink sugar in my coffee, because the coffee is too bitter to handle without it, but since I’ve gotten this machine, I’ve been experimenting with drinking it without, and it’s possible because it’s not bitter. There are about a thousand different flavours of pods you can buy. You can get them online if you like but I pretty quickly discovered the Nespresso store here in Vancouver. It’s hard to find–it’s in the basement of the Bay–and there they sell pods and also sample flavors and are available for questions. You can also return your spent pods there for recycling. Pods cost about $.75 each. While that’s more expensive than the coffee I was buying before, I am actually saving money, because I go out for coffee less. Before, I’d make my first cup of the day at home, and then, pretty much 7 days a week, I’d have my second cup at a coffee shop, running me anywhere between $2-2.50 a pop. Now, I’m more often than not electing to have my second cup of the day at home. It’s honestly just better coffee than I can get in a coffee shop, unless I pay $5 for it. $.75 a pop makes that look like a bargain. Non coffee lovers will really like this machine, too. I make my son steamed milk with a shot of vanilla syrup, and he loves it. I also used non-dairy milk in it once when we ran out of milk, and it worked fine. The foam wasn’t quite as foamy, but it did the trick. I haven’t yet, but I want to, in the future, try making matcha lattes with it. I’ve had the Delonghi Nespresso Lattissima Touch for about three weeks now, and I have been using it every day, and have had zero temptation to go back to my old coffee ways. I even had some girlfriends over for brunch, and they loved the coffee as well. It was just a matter of teaching this old dog some new tricks. Or this old school coffee lover some new rituals. I’m pretty sure I’m never going back to my old stovetop espresso maker. This is the coffee you’ve been looking for. There’s a coffee shop I work at quite a bit near where I live here in Vancouver, WE Coffee. I love it, because it has all the things I need: good coffee, good snacks (maple muffins to die for, gluten-free goodies as well), and good wifi. It’s a small business, locally owned and operated, not a chain or a franchise, and I like to support local business. They roast their own beans, and they are always very thankful for my business. I was leaving the other day after a meeting with a student, when I noticed a sticker on the door. Now, I’d heard about Suspended Coffee already, but if you haven’t, let me tell you about it. Suspended Coffee is a way to pay it forward. You go into a sanctioned Suspended Coffee supporter, and buy yourself a coffee, and then buy another one as well (or more, if you like). Someone who then can’t afford coffee can come into that coffee shop and you have, in essence, bought that person a coffee. There was just a story in the news the other day about a guy who did this (not through Suspended Coffee) at a Tim Horton’s in Edmonton. It’s a trend that’s catching on. I love this idea: I’m a coffee addict, and I know the pleasure that I get from my daily Joe. I love the concept of paying that joy forward. 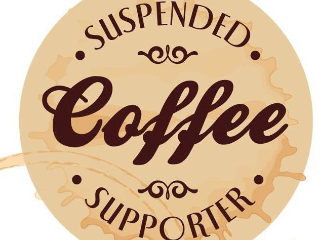 Look for the Suspended Coffee logo at your local java joint, and consider buying an extra cup for someone in need the next time. For a list of coffee shops and more information, visit suspendedcoffees.com, or check out their Facebook Page.